83 Commercial Real Estate & Properties in North Lakes are listed in 5 categories. We have 63 OfficesSale & Lease , 20 Retail ShopsSale & Lease , 20 Industrial Warehouses Sale & Lease , 12 ShowroomsSale & Lease and 12 Medical and Consulting PropertiesSale & Lease . 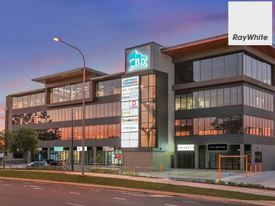 Ray White Commercial Northern Corridor is pleased to offer Suite 2B/2 Flinders Parade North Lakes for Sale. Located in the heart of North Lakes this professional office suite is only minutes from Westfield North Lakes, IKEA, Costco, New North Lakes Medical Precinct has quick and easy access to Bruce Highway. Features: 137m2 Office/Medical Consultation Space 4x Individual Office Spaces + 1x Private Room Large Reception with Waiting Area Kitchen 5x Exclusive On Site Car Parks Secure Basement Parking On Site Cafe Ducted Air Conditioning Throughout Attractive Glass Frontage Male Female Amenities On Site For further information or to book an inspection, please contact the EXCLUSIVE Agents Aaron Canavan or Chris Massie.